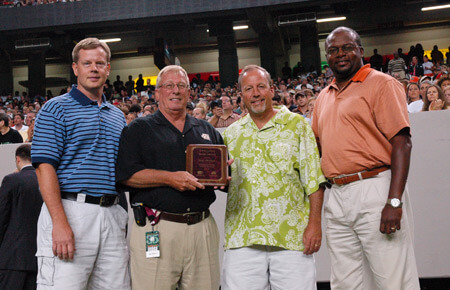 During the evening edition of the Coltrin & Associates DCI Southeastern Championship in Atlanta, Supervisor of Music for Cobb County (Atlanta area) Gary Markham received the first-ever Coltrin & Associates and Drum Corps International Excellence in Music Education Award, presented by Stephen H. Coltrin, founder and CEO of the company. 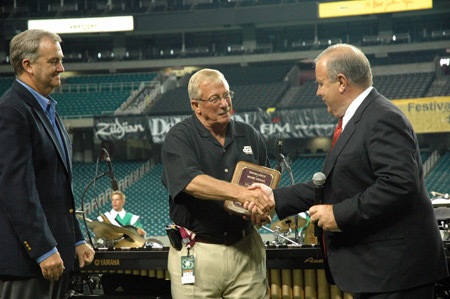 Markham is beginning his 40th year in education, having served as a band director in Pennsylvania and Virginia, former education director for Bands of America and current chief judge for Bands of America's autumn events, as well as the Supervisor of Music for Cobb County Schools outside Atlanta, in which he is now entering his 14th year. Around the drum corps activity since the mid-1970s, Markham has taught, written arrangements for and judged drum corps. Gary Markham accepts the award from Stephen H. Coltrin. Markham was caught by total surprise when he learned earlier in the week that he would be receiving this first-ever music education award. "It's absolutely flattering," Markham said. "My career has been mostly behind-the-scenes and dedicated to advancing the activity forward. I asked Steve Coltrin how they found out about me and he jokingly said, 'We've got spies.'" This genesis of the award stems from another award in education that the strategic communications and public relations firm has been presenting for 10 years in conjunction with the International Radio and Television Society, the Coltrin Communications Professor of the Year Award. That award is presented each year in honor of Stephen Coltrin's father, who worked his entire professional life in education. Playing off of the communications award, Coltrin & Associates started to look at a way of doing something for people who have made a contribution in the field of music education. "I'm concerned that too many kids only see superstars or criminals on television. There are countless thousands of people making a difference in their communities and the kids never see those. We want to recognize excellence and we chose to do it through drum corps because of the contributions we've seen the activity make for young people," said Coltrin. "We will do this annually for that reason ... to show young people you don't have to be a football star or a billionaire. They can work in education and make a huge difference in the lives of a lot of young people. We want to bring some recognition to these fine people and Gary Markham represents a lot of these hard working people around the country." For now, the Coltrin/DCI award consists of a plaque and recognition, exactly how the communications award started. But 10 years later, that award has grown in scope and now involves bringing a group of people to New York City for a ceremony. This year marked the second time that Coltrin & Associates served as presenting sponsor of the DCI Southeastern Championship. "Last year was the first year of sponsoring the DCI Southeastern Championship. It means a lot to me," said Coltrin. "The kids are absolutely engaged in the discipline, athleticism, musicianship, competition and camaraderie that go into making this a professional quality entertainment. If you're not at the Boston Pops or a Broadway musical, you should be here. This is one of the best shows in America." Personally, Coltrin feels that those who choose to participate in drum corps will be impacted in a positive way in whatever field they choose to participate in. "Think of all the things these kids could be doing tonight. I think you've got to put this at the top of the list. That's what I see when I look out on the field," he said. band directors Michael Sessoms, Mike Back and Mark Hoskins. And what about Gary Markham and all those who contribute to helping the marchers get to the field? Coltrin asserted, "These folks give of their time and energy that helps these kids put everything together. We need to say to the kids, 'these guys are real heroes. Gary Markham is a hero.' "I talk about drum corps a lot when I travel all around the world. I've met a reporter who was in drum corps. I've met a physician who marched. They never forget the impact it's had on their lives. We want to make sure the educators are recognized for their role in the support they give this process."